I'm currently playing a game where I have a number of depots that I'm keeping open to expand multiple separate sections of my network. It would be handy to be able to rename my depots so I can more easily track which one is which. A "Depot List"" in the List menu would be nice, too. We've had these features requested before, I think. I seem to recall there being some problems, but don't remember what. Or maybe just nobody found it useful to implement, or at least useful enough to spend time on it. Search engine in lists, It would also be a good idea. Ah, hopefully the latter more than the former. More hope that way. hehe. Yeah, it's definitely not a huge feature, for sure. Here is an earlier discussion I found. That time, our dictator had another focus. A list showing which depots have vehicles, both assembled and disassembled, would be useful for me. That time, our dictator had another focus. ... but originally it was my idea. Right - this would be a relatively simple idea to implement, that main stumbling block I can see is the size of the depot window, which is already one of, if not the largest in the game. Are there objections to reformatting the window slightly to avoid any extra height? What sort of reformatting had you in mind? 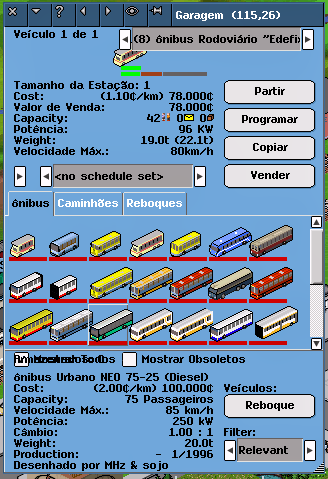 There is a design principle in Simutrans that all windows should have equal width. It makes it easier to arrange them tightly. The screenshots seems to be of windows wider than the normal width. Or is the default window width pak set size dependent? Ahh - I think that Simutrans-Experimental widened depot windows ages ago, so I didn't notice. I've not altered the width - that's the minimum that's allowed in pak128.Britain, the width is dependent on pak size I think, which is a problem as with 64 size paks there's not enough space to get 3 columns of information across the top section of the window. Ideas? Hmm... The dialog isn't as high in pak64, so maybe the solution is to make the number of columns dynamic depending on the width of the window. This applies both to the convoy columns and the vehicle columns. So it does dynamically switch between one and two columns already? The drop down overlapping the vehicle selection will not work great. It's currently fixed at two info columns which fit with pak64 at minimum dialog width. Do note some of the translation strings are quite lengthy - german! - leaving quite a bit of empty space in more concise languages. EDIT: dropdowns don't work at the bottom of a dialog either; End up clipped. But there are two drop downs there already, one of which is essential. Or is there some fundamental difference between the row with assembled vehicles and the grid with lose vehicles further down? If so, does it have to be?